Residents could not believe their eyes when a small aircraft landed in front of their homes early on Tuesday morning. Jan Smit from the Brits Lookout security group told Kormorant of the unusual Tuesday morning that he and Brits residents had. On Tuesday morning, reminiscent of the film Donnie Darko, he received a voicenote from an agitated resident about an aeroplane stuck in front of his house. 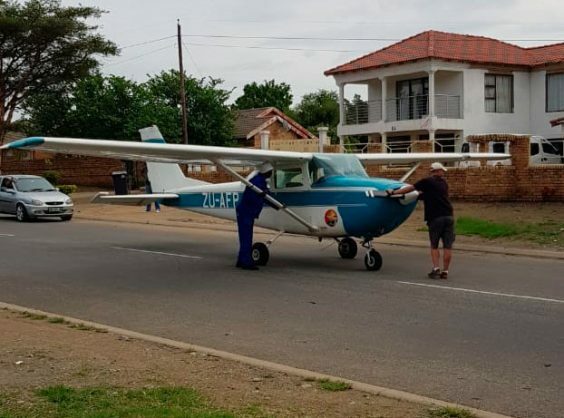 “I thought it was a joke but went out to the spot and to my surprise, an abandoned light aircraft was in the centre of the road,” said Smit. The resident wanted Jan Smit to check on the airplane on Magaliesberg Drive, as he was not home. “The pilot was nowhere to be seen, but an aircraft mechanic later arrived and worked on the plane, and it took off again. “From what information we could gather, it seems that something went wrong and the plane had to do an emergency landing and did so in Magaliesberg Drive,” Smit said. Kormorant is still trying to establish who the plane belongs to.